One of the most important things we can do today is understand the Bible, as it is increasingly relevant to modern times. Folse’s work is the examination of the book of Genesis in the Bible which presents every story in the book, from Adam and Eve to Noah’s Ark and more. The book is based upon Folse’s interpretation of the scriptures, making it a Midrash, enabling it to be written based on the words in the Bible without commentary from previous interpreters. Folse also utilized her professional background as a Certified Public Accountant to distill complex materials into an easily readable book on Christianity for Christians and non-Christians alike. The book also highlights how the Bible is relevant to today’s modern world, such as how God took Abraham and made a great nation from him despite Abraham coming from a Pagan background. Paganism was historically looked down upon in the Bible, though Folse shows how no matter where you come from, you are never beyond God’s plan for your greatness. 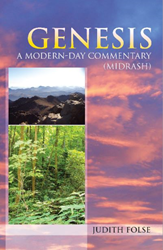 In “Genesis: A Modern-Day Commentary (Midrash),” Christians and non-Christians alike can understand the history and relevance that the Bible gives them through moral and practical guidance about how to navigate life successfully.